As I just wrote, this has been a crazy week, and next week doesn’t look much better. Luckily, I had a great stress relief valve last night: a concert at McCabes Guitar Shop in Santa Monica. 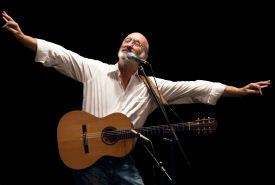 Last night’s artist was Noel Paul Stookey, who is perhaps best known as the “Paul” in “Peter, Paul and Mary”. Although I’ve been a fan of PP&M since I was in my teen, I’ve tended to favor Peter Yarrow over the other performers. But the last time I saw Peter solo (at AJU), his performance was rambling and wandering. I also discovered that Noel Paul was giving concerts at McCabes. We went last year, and we just loved the show, the music, the humor, and the man. So when Noel Paul showed on the schedule, I just went and ordered tickets. Upcoming Theatre and Concerts: Today brings the Southern California Renaissance Faire. May brings “The Lion in Winter” at The Colony Theatre (FB), and “Cat on a Hot Tin Roof” at REP East (FB), as well as “Hairspray” at Nobel Middle School. I may also be scheduling “Porgy and Bess” at the Ahmanson. June is mostly open pending scheduling of an MRJ meeting, but I will try to fit in as much of the Hollywood Fringe Festival as I can. July will be busy: “Ghost” at the Pantages (FB) on 7/5, “Return to the Forbidden Planet” at REP East (FB) the weekend of 7/12, “Once” at the Pantages (FB) on 7/19, “Bye Bye Birdie” at Cabrillo Music Theatre (FB) on 7/26, and “Family Planning” at The Colony Theatre (FB) on 8/2. As always, I’m keeping my eyes open for interesting productions mentioned on sites such as Bitter-Lemons, and Musicals in LA, as well as productions I see on Goldstar, LA Stage Tix, Plays411.